Step out of Skardu to go to Shigar and see Amburiq Mosque, which is approximately 54 minutes away. Spend the 18th (Thu) exploring nature at Deosai National Park. There's still lots to do: explore the activities along Upper Kachura Lake, don't miss a visit to Kharphocho Fort, admire the sheer force of Manthokha Waterfall, and contemplate in the serene atmosphere at Manthal Buddha Rock. To find traveler tips, more things to do, other places to visit, and more tourist information, you can read our Skardu online tour itinerary builder . Islamabad to Skardu is an approximately 1.5-hour flight. Wrap up your sightseeing on the 20th (Sat) early enough to travel to Naran. The main reason to take a trip to Naran remains the surrounding nature, which includes Kaghan Valley. 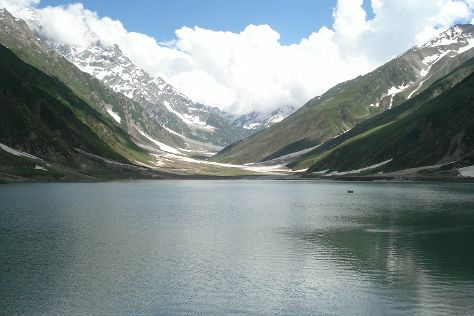 Kick off your visit on the 21st (Sun): contemplate the waterfront views at Saif-ul-Muluk Lake. For traveler tips, other places to visit, and other tourist information, refer to the Naran tour itinerary tool . Traveling by combination of flight and taxi from Skardu to Naran takes 5.5 hours. Alternatively, you can drive. Wrap up your sightseeing by early afternoon on the 21st (Sun) to allow enough time to drive to Hunza. 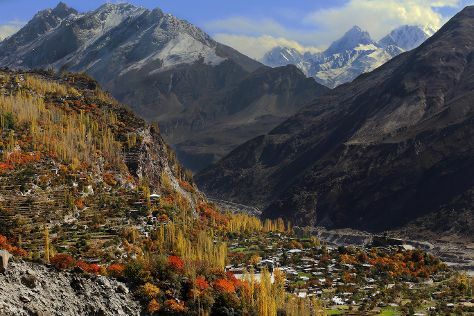 On the 22nd (Mon), appreciate the views at Hunza Valley, then admire the verdant scenery at Hunza Valley, then explore the historical opulence of Baltit Fort, and finally appreciate the views at Eagles Nest. Get ready for a full day of sightseeing on the next day: take in the dramatic natural features at Passu Glacier, take in the views from Hussaini Hanging Bridge, and then don't miss a visit to Ganish. To find maps, photos, traveler tips, and other tourist information, read Hunza trip planning site . Traveling by car from Naran to Hunza takes 5.5 hours. Finish your sightseeing early on the 23rd (Tue) so you can travel to Peshawar. Peshawar is the capital of the Pakistani province of Khyber Pakhtunkhwa. You'll find plenty of places to visit near Peshawar: Takht-i-Bahi (in Mardan) and Khyber Pass (in Landi Kotal). Next up on the itinerary: admire the striking features of Islamia College, stroll around Khalid Bin Waled Park, don't miss a visit to Khyber Pass, and get engrossed in the history at Peshawar Gandhara Museum. To find other places to visit, more things to do, ratings, and other tourist information, you can read our Peshawar online trip maker . Traveling by combination of taxi and flight from Hunza to Peshawar takes 5.5 hours. Alternatively, you can drive. April in Peshawar sees daily highs of 35°C and lows of 20°C at night. Finish up your sightseeing early on the 26th (Fri) so you can travel to Karachi. Karachi is known for shopping, museums, nightlife, beaches, and parks. Your plan includes some of its best attractions: browse the different shops at Dolmen Mall Clifton, examine the collection at State Bank Museum, take in the exciting artwork at Frere Hall, and ponder the world of politics at High Court Building. To find other places to visit, ratings, traveler tips, and other tourist information, read our Karachi trip planner. Traveling by flight from Peshawar to Karachi takes 4 hours. Alternatively, you can drive. In April, Karachi is somewhat warmer than Peshawar - with highs of 41°C and lows of 28°C. Cap off your sightseeing on the 1st (Wed) early enough to travel to Multan. Well-fortified due to its strategic location in the past, Multan has a number of impressive historic gates. Multan is known for parks, historic sites, shopping, and outdoors. Your plan includes some of its best attractions: don't miss a visit to Darbar of Hazrat Shah Rukn-E-Alam, appreciate the history behind Monument of Van Alexander Agnew, stroll around Yadgar e Shuhada Park, and admire the landmark architecture of Multan Garrison Mess. For ratings, where to stay, reviews, and tourist information, go to the Multan route planner . Fly from Karachi to Multan in 4 hours. Alternatively, you can drive; or do a combination of bus and train. In May, daily temperatures in Multan can reach 47°C, while at night they dip to 31°C. Finish your sightseeing early on the 4th (Sat) to allow enough time to drive to Faisalabad. Founded in the late 19th century as a British colonial outpost, Faisalabad has grown into a center of the nation's agricultural and textile industry, for which it gained the nickname the "Manchester of Pakistan." Its urban planning reflects these origins, with an iconic clock tower standing at the epicenter of the city, surrounded by eight large roads shooting off from it in Union Jack formation. Kick off your visit on the 5th (Sun): explore and take pictures at University of Agriculture, then admire the landmark architecture of Clock Tower, then walk around Pahari Grounds, and finally buy something for everyone on your list at Sitara Mall. On the 6th (Mon), you'll have a packed day of sightseeing: explore and take pictures at Government College University Faisalabad, admire the local landmark of Gumti Water Fountain, then take an in-depth tour of Lyallpur Museum, and finally admire the natural beauty at Jinnah Gardens. For where to stay, maps, and other tourist information, you can read our Faisalabad trip maker website . You can drive from Multan to Faisalabad in 3.5 hours. Alternatively, you can take a train. When traveling from Multan in May, plan for little chillier days and a bit warmer nights in Faisalabad: temperatures range from 41°C by day to 41°C at night. Finish your sightseeing early on the 6th (Mon) to allow enough time to drive to Lahore. Lahore is known for historic sites, museums, shopping, parks, and zoos & aquariums. Your plan includes some of its best attractions: contemplate in the serene atmosphere at Badshahi Mosque, explore the historical opulence of Lahore Guided tours, have fun at Bedian Spins Cricket Ground, and take in nature's colorful creations at Shalimar Bagh (Shalimar Gardens). To find reviews, maps, photos, and other tourist information, use the Lahore road trip planning site . You can drive from Faisalabad to Lahore in 2 hours. Alternatively, you can take a train. Traveling from Faisalabad in May, you will find days in Lahore are a bit warmer (46°C), and nights are a bit cooler (30°C). Cap off your sightseeing on the 10th (Fri) early enough to travel to Islamabad. Change things up with a short trip to Karakoram Highway in Hassan Abdal (about 1h 10 min away). There's much more to do: take in the spiritual surroundings of Faisal Mosque, explore the striking landscape at Margalla Hills, examine the collection at Lok Virsa Museum, and trek along Trail 5. 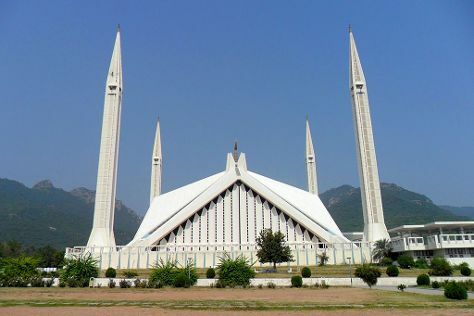 To find traveler tips, where to stay, other places to visit, and other tourist information, read Islamabad road trip planning website . You can fly from Lahore to Islamabad in 1.5 hours. Other options are to drive; or do a combination of train, bus, and taxi. Traveling from Lahore in May, things will get slightly colder in Islamabad: highs are around 42°C and lows about 26°C. Finish your sightseeing early on the 15th (Wed) to allow enough time to travel back home.